The DC universe is in peril... and this time, only the villains can save the day! 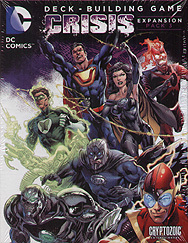 Crisis Expansion Pack 3 delivers new challenges and depth to all DC Comics Deck-building Games. It takes some serious skills to save the universe. Are you up to the task? Six all-new playable oversized characters from the Suicide Squad. 14 "Impossible Mode" Crime Syndicate Super-Villains to battle against and Crisis versions of eight oversized characters such as Lex Luthor, Sinestro, Bane and many more. Two unique modes of cooperative play, with faster gameplay. Includes NEW "Hidden Objective" mode. New main deck cards for competitive players.